Below you will find you will find links that provide useful information and images from my trip. 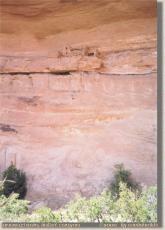 Please note that in 1999 the BLM has converted the whole Cedar Mesa area into a permit/fee area. For detailed information take a look at their site: BLM Grand Gulch Page for up to date information on the area and an Area Map and a Cedar Mesa Map. What makes this area of Utah especially attractive are the numerous 'wild' ruins of the Anasazi or "Ancient Ones" who lived in this region some 700 to 1,800 years ago. Please do not walk on or touch the ruins**, they are very fragile and in the last few years have suffered tremendous erosion due to careless hikers or due to deliberate vandalism. Do not take any artifact from the ruins and also do not rearrange them. Archeologists can learn much from the exact position an artifact if found. Enjoy the ruins in the setting you find them in and take a few moments to imagine the life of the Ancient Ones. 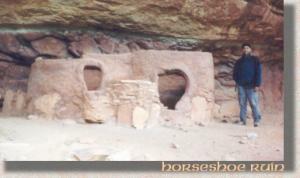 Another good Grand Gulch Rock Art Site. These maps cost about US$4.00 each and can be ordered by mail (foreign orders accepted, payment via credit card). So instead of paying US$10.00 or more at your local supplier, why not order them. I've done so and the USGS is fairly efficient. BLM Grand Gulch page: Up to date info on permits, fees etc. 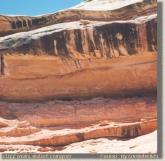 Grand Gulch Primitive Area: JQJ's Rock Art Pages, many nice images of Utah Rock Art.